Ultrasound is a powerful diagnostic tool that we use to diagnose medical problems. 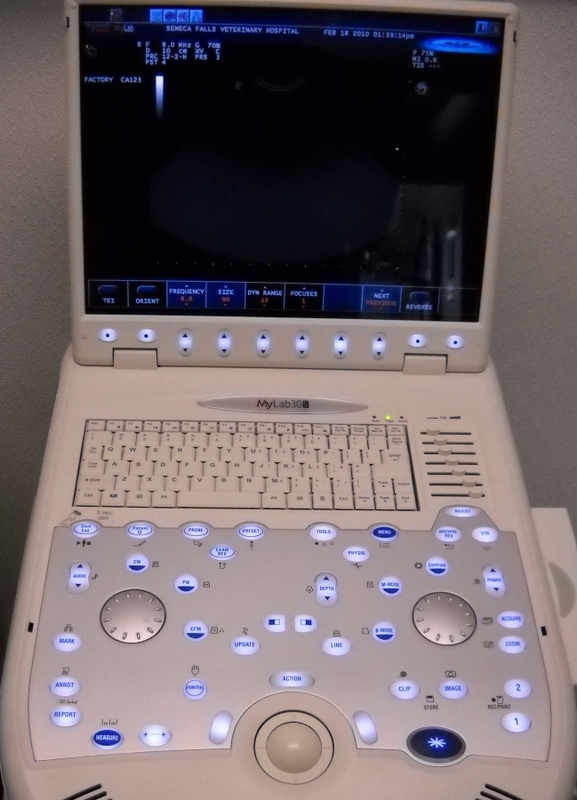 The ultrasound machine generates a high frequency sound beam through a probe that is placed on the patient. The sound wave passes harmlessly through the patient.The ultrasound machine uses a computer to generate an image based on how much of the original beam is reflected back from the patient.The image is produced in real time. Ultrasound is often used in combination with x-rays. X-rays will show if an organ is enlarged, but wont show what the insde of the organ looks like. The ultrasound image shows what the inside of the organ looks like. Ultrasound can also be used to look at moving organ such as the heart in real time. Some ultrasound machines have advanced features such as power Doppler, color flow Doppler and M-mode. Power Doppler is used to look at blood flow through an organ.Color flow Doppler is used to look for abnormal blood flow through the heart and M-mode is used to evaluate the pumping ability of the heart. We use a MyLab30 Digital ultrasound machine at Seneca Falls Veterinary Hospital. The MyLab30 has many advanced features including Power Doppler,Color flow mapping Doppler,Continuous wave Doppler and M-mode.We use a high resolution probe (3-9 mhz) to generate our images The patient lies in a comfy cushion and the probe is gently placed on the area of interest.The MyLab30 can store the images we take in digital format and that allows us to email our images to our Radiology consultation service (PETRAYS) for an expert second opinion. 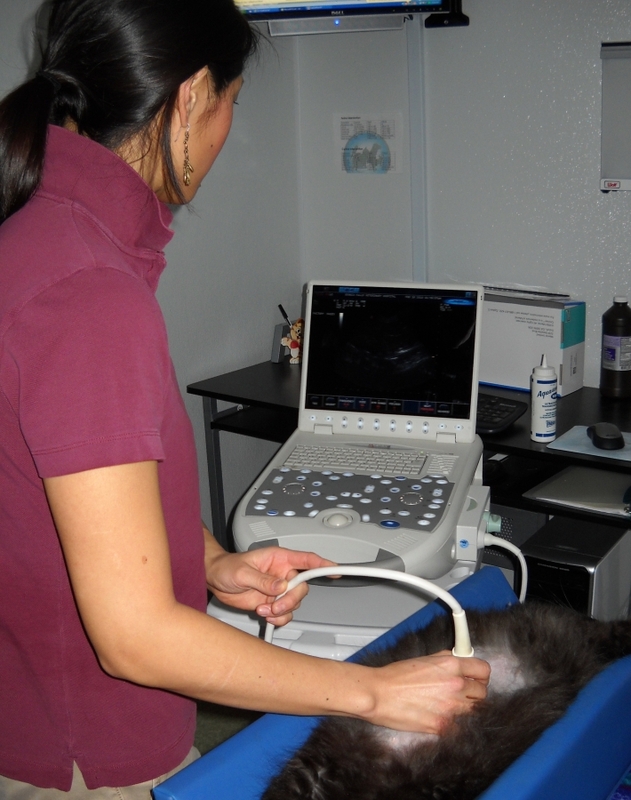 The ultrasound examination is painless and non-invasive and can be performed with no sedation in most pets. Here are some examples of the images from clinical cases we have seen. 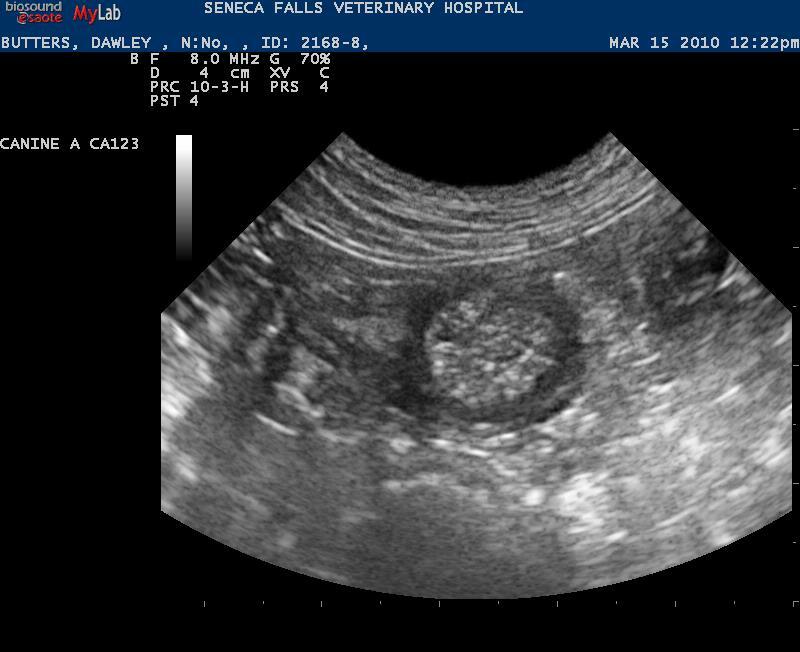 This is an image of a dogs stomach.The black area in the middle of the picture is the inside of the stomach and the grey area around that is the stomach wall.This dog had a very thickened stomach. 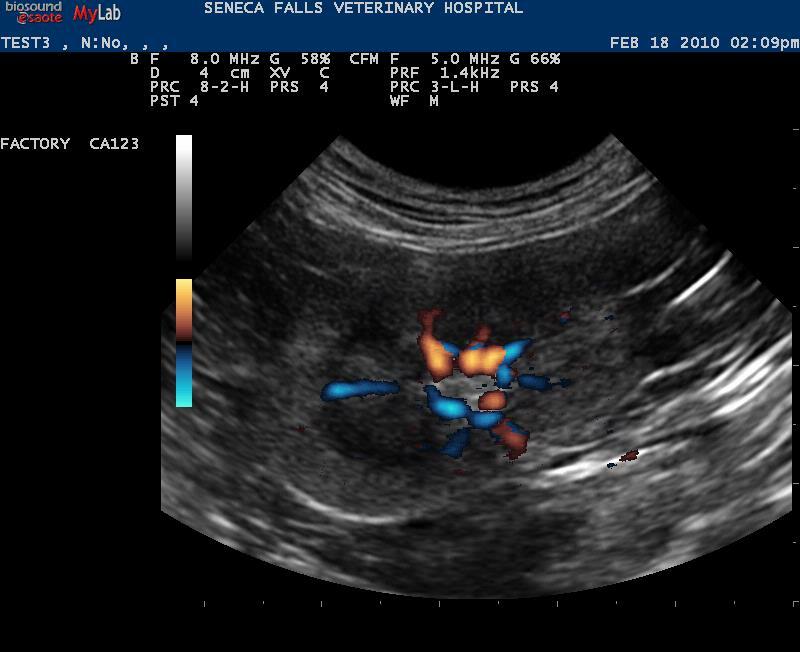 This is a Power Doppler study of a cats kidney.The blue and orange areas represent blood vessels within the kidney.Power Doppler can be used to detect blood clots or areas of an organ that are not receiving a normal supply of blood. Here is an image of the duodenum and pancreas in the dog. The duodenum is the hook shaped structure that goes from right to left.The grey area within the hook is the pancreas. This dog has inflammation of the pancreas (pancreatitis). Pancreatitis is difficult to diagnose and ultrasound is the most accurate way to diagnose this serious disease. 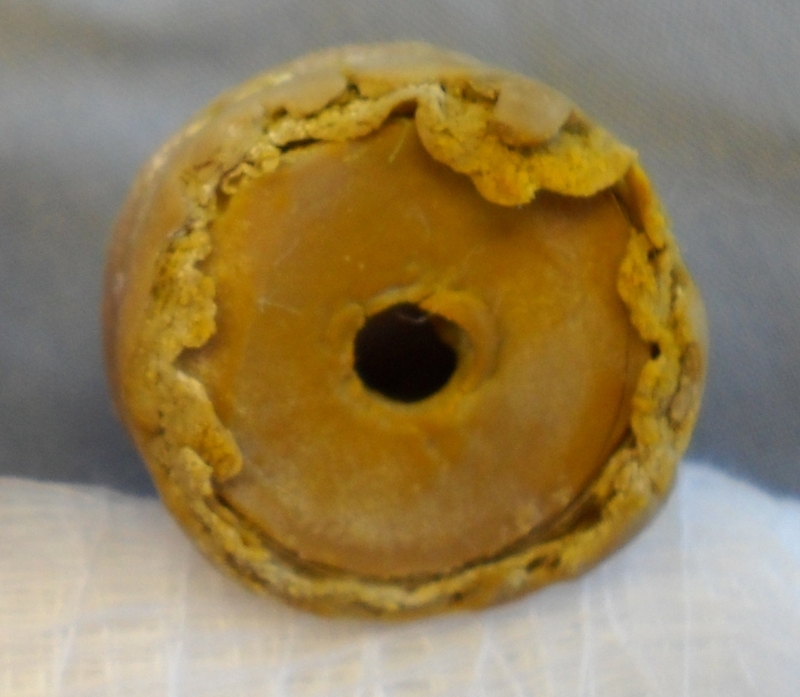 The ultrasound image shows a round object in the intestine.This piece of rubber was removed at surgery. 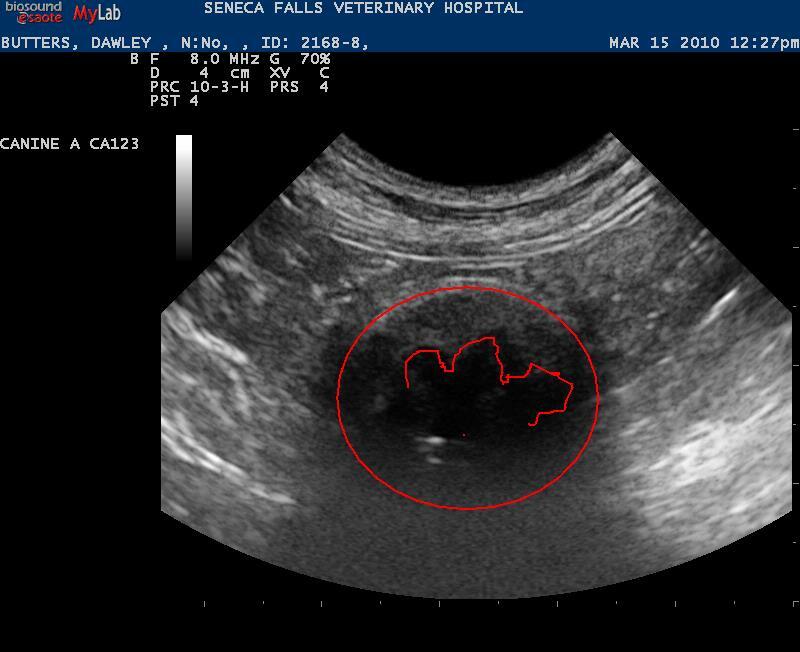 The ultrasound image shows a secondforeign body in the intestines of the same dog as above.The second image shows the foreign body highlighted in red.The third image shows what we found at surgery blocking the intestines. 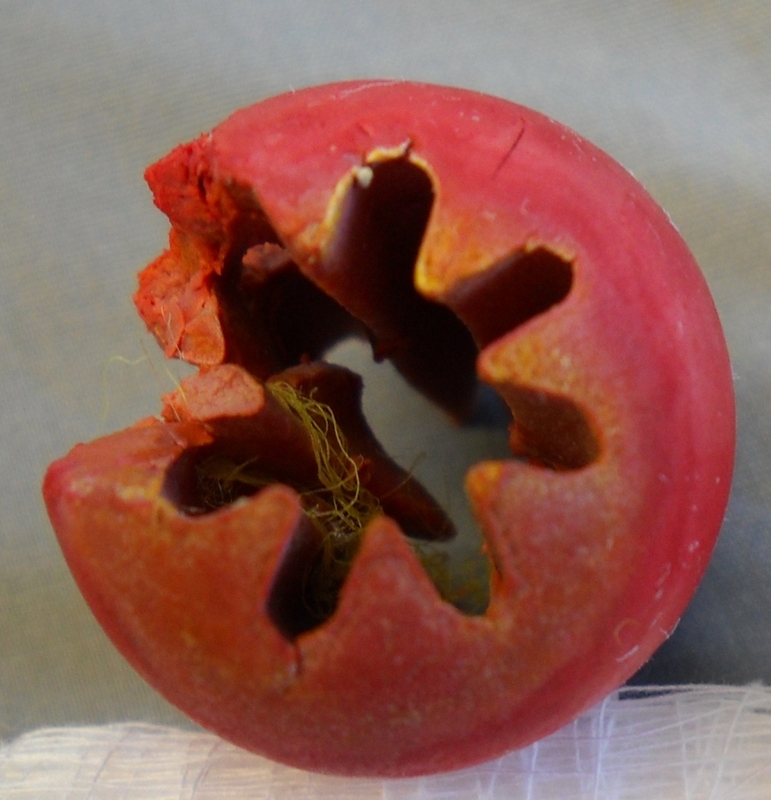 This image shows a side view of both foreign objects we found in the dog.